Married life is wonderful! The wedding dance went awesome and there was a lot of yelling. Everyone loved it. Thank you so much for everything. We definitely could not have done it without you. Thank you so much for the lessons! If you click on the link and scroll to the bottom, you will see that Jeremy executed the DIP PERFECTLY!!! :) Mooned the DJ and everything! I've been meaning to send you an email for awhile now to thank you for all you did to help us prepare for our dance at our daughter's wedding. We had such a blast and everyone was so surprised and was hooting and hollering and having a great ole time watching us. So many people came up to us afterwards and complimented us on how great we looked. The photographer said he's photographed many weddings before but never seen anything that cool done for the bride and groom. Anyway, it was a lot of fun working with you and was so good for Brian and me in so many ways. We've definitely talked about continuing some classes so we'll be in touch. Thanks again Dave! It has felt like forever since we've seen you too! The dance went AMAZING we had a wonderful time and were totally in the moment. It was cool at the end because we looked around and everyone was either screaming, or crying with joy! ;-) One of my co-workers that didn't even have dancing at her wedding asked her husband if he would learn with her!!! Pete and I would love to start dancing again. . . The dance went SO WELL! We definitely nailed it, and had a lot of fun, the dip at the end really got people going. We had everything videotaped and we just watched it recently. It looked as good as it felt. We will have to get you the clip of it. People definitely loved it and were very impressed. Other than our families, we hadn't told anyone we were taking lessons so they mostly expected the old "high-school swaying" routine. They were blown away to see us do a real dance. We also danced on our honeymoon and at a few friends' weddings since, and have loved it. We definitely can't thank you enough and hope to learn some other dances too in the future. The wedding dance was fantastic! . . . The feedback from friends and family was phenomenal. Something so special and different for BJ and I. . . . the crowd went wild! I will never forget the occasion. . . . it was fantastic and one I will treasure forever. Thank you Dave. Our first dance was amazing!!! The dip was a HUGE hit! I wanted to thank you for all the dance lessons you endured with Cassie and I. I sometimes felt like I had two left feet and a mental block during our sessions. . . We had a wonderful Wedding at The Brown Palace on Jan. 23, 2010. I've attached a few pictures for you and wanted you to know we were a hit at the Reception. When I first looked at the dance floor, it was scary small. After talking to the staff, they added one more row of flooring for me. We practiced after our last session with you in my shop until my knees ached. The morning of the Wedding I stepped off my program a dozen times by myself and planned out all my moves mentally. I couldn't bear the thought of stepping on her dress, messing up a spin, or sending her flying, so I focused, made my plan, and etched it in my mind. Freeform was not an option on my mind, just success. Well, we pulled it off without a flaw, everyone said it was magnificent, they stood and cheered and could not believe their eyes, everyone was surprised. Cass looked beautiful, we flowed through the music, she spun crisply and with ease, beaming the entire time, and in the end, I dipped her flawlessly, stunning the applauding room! Thank you so much! I've been meaning to email you and tell you how awesome our dance was at our wedding. Every person there had their eyes on us and were yelling "Holy Dancing With the Stars!" It was so great! We cannot believe it has been 2 years either. I think we are going to the Melting Pot on Saturday. Thanks for the email! Private lessons were totally worth it! It helped us so much and has made dancing more fun. It was great to dance Lindy Hop, Jitter Bug and Charleston at our wedding. Thank you!!!! Thank you so much for your support of our marriage! We felt wonderful for our dance! It was very special. We had so much fun learning with you and it was a very good stress relief in those last months. Thank you so much! Also, I have to tell youwe've been to TONS of weddings since ours, and no one's dance moves have quite lived up to the ones you taught us. Seen some cute 'choreographed' routines, but learning to 'just dance' was just the greatest. Thanks again for everything! [The Father/Daughter dance] went almost too wellpeople knew we had been practicing. :-) We got a number of compliments, but the real joy for me was being able to have the dance with my daughter; thanks for making it possible. [Our wedding dance] was AWESOME :) The only move Joe forgot to do was the zig zag. We had lots of cheering and lots of applause at the end. I think my dip was ok. As soon as my sister gets the video loaded on to youtube or something like that I will send it to you. The girls' dance was also a blast!! Joe mentioned just yesterday that he wants to keep dancing so we don't lose what we learned!! Hi Dave, the wedding was beautiful. My dance with Keri went quite good. I did feel nervous before but once the dance started everything worked out. [Husband] Dave and I had more fun then we have had in the last 20 years dancing. He got so brave he danced with a few other people. Thanks for all your patience and great teaching. Thank you for all you did to make Tim and Amanda's first dance as Mr. and Mrs. Dalton special. They were nervous and left a couple of things out, nonetheless, it was beautiful. As for the dance Tim and I worked on, everything was going quite well and Tim whispers 'I can't remember how to start the single twinkle.' I say, 'Our hips line up and we step with our inside foot.' He says, 'Right,' (pause, 1,2,3) 'OK.' I thinking he means now turn 90 degrees and he says, 'not now.' So, I get back in step and we continue. Good thing we practiced me misinterpreting the signal. I enjoy dancing the waltz and will treasure the memory of waltzing with my son at his wedding. Thank you (a million times over). The dance went greatpeople were cheering and clapping along to the musicon their feet by the end! Couldn't believe it! Lots of compliments. You were an incredible help! Hi Dave! Wedding went very well. Everyone loved the dances. . . we did two. We have a video of them. . . . We are going to try to send you a copy as soon as we can. Tons of people told us they thought it was awesome. We are still dancing and we hope to learn a new style when we come back from Georgia! Hope things are well with you. The wedding was wonderful! And our dance was well received. We received many compliments during the evening. More importantly, the event went very well and everyone had a great time! Now we have the dance bug and are looking forward to the next dance chapter! We're not sure what that will be yet, but we sure enjoyed the experience so far! Cheers! It was so much fun! I laughed and grinned through the whole dance which hopefully diverted eyes from the terrible mess I made with my feet! Ha! Dary was a trooper and hung on to me and helped me recover from time to time. I think I was so overwhelmed by the whole day, hadn't eaten, and felt a little bit "out of body" by the time the dance came. Everyone loved it and we were greeted by cheers and applause! We are still enjoying the dance here at home and are still practicing those more complicated moves so to perfect it! Thanks for everything. It was a great experience in every way! Hi Dave, I have wanted to call you and give the report ever since the wedding. We had SO MUCH FUN!! The dances went amazingly well, in fact so well that our friends who know that we started out as total 'non-dancers' were all asking us who our dance instructor washa! Brent and Erica's first dance was one of the most beautiful and carefree dances I think I have ever seen at a wedding. Our dance with all three of us went so well, too. The friends and relatives that were there surprised us by breaking into cheers and hoots and hollers as the guys went to their knees and then spun us around on 'I want to marry you and take you home.' Then the most amazing thing. . . when it came time to dip all of us couples were in perfect sync. It was just a God-thing! And the other great thing. . . Steve didn't gruntha! There was so much joy and so much delight in the air. So many comments about how much fun it was to do that dance together. On the Saturday before we had about 35 of our family over to our house for a pre-wedding barbeque. Steve and I both grew up in a rigid church environment where dancing was taboo and so there was no such thing at our wedding 30 years ago. But all that has changed (thank goodness) and so I told my father '. . . Before Saturday is over, we are going to dance together!' We spent about 2 hours in the afternoon teaching mom and dad the 'moves' and by the end of the day we were dancing to a slow song. So, at the wedding I had a first dance with my father as well. It was so cool!!! Then my parents danced with each other for the first time in their lives. They've been married about 54 years. Then, shock of all. . . Steve got his 86 year old mother (complete with neck brace) out on the dance floor and she danced for the first time in her life. It was a day that felt like a piece of heaven. Thank you SO MUCH for teaching us on the fast track and for teaching us so well. Learning was almost as much fun as actually doing it at the wedding! Hope we can show you the video some time. You would be proud. :) It was a pleasure working with you, too! Thanks again, We appreciate you much! I just wanted to let you the dancing at the wedding was a great success. Elizabeth and Don received a standing ovation when they were done. They looked great. Don's dad just kept saying over and over 'I can't believe he's doing that!' Anyway, just wanted to let you know we had a great time on the dance floor. Our wedding was fabulous and our 1st dance went great! We received applause several times during the dance and a standing ovation at the end! Numerous people came up to us and said how great it was. We appreciate your lessons and had a lot of fun in the process, something I would have never thought possible before starting them. They gave us a standing ovation! . . . Thanks so much for everything! Our dance was amazing and I can't wait to show you a video when it is finished! Aaron and I can't wait to start up again when we get home. The wedding dance went very well! It was a little difficult though, the floor was really slippery. We had a ton of fun with it though. . . The best part is that Jason did not drop me when he dipped me :) Thanks for all of your help! Hopefully we will see you again soon for some more lessons. . .
Our wedding dance was just about perfect, we received a standing ovation from our family and friends thanks to you. We feel so blessed to have had you as our dance instructor. Let us know when you have a special dance event coming up so we can come watch you. Keep in touch. The entire day was perfect! Our first dance went really well, as well as our dances with our parents. We are so glad we had a chance to spend some time in your studio and work on our moves! I would love to take more classes with you. During the school semester things get crazy and hectic which makes it difficult to do anything fun. As soon as I can, I will be signing up for more. We ended up having a fantastic dance and wedding. We ended up getting some snow so it moved our outside wedding indoors but it was still a blast. We had a great 1st dance and got lots of comments. Thanks for all your help! About our dance, it went awesome! Believe it or not, with all the anticipation I forgot a lot of our moves but Tom held it together. Everyone commented on how awesome we looked. . . Thanks again for all of your help and flexibility. We hope to see you again to learn some new dances. . . .our dance went great! We totally nailed it!! We got so many compliments from so many people (including someone who thought we looked like the "dancing with the stars" TV show). We appreciate all your hard work and admire the way you are able to convey your expertise to such novices. By the waywe also looked at one another and smiled the whole time and did not look down. Dave had a wonderful way of taking two novice dancers to the point of instilling a desire to pursue the art of dance, the joy of movement with music, in a very short time. His wonderful comparisons of dance to the even finer art of building a close and intimate marriage imparted wisdom to us as we prepared for our wedding-day waltz. We took dance classes from Dave for our wedding. We wanted to do something fun and exciting for our first dance. We knew the music we wanted to use, but had no idea what to do for the actual dance. Dave recommended a style of dance and then taught us the necessary steps for it to be rehearsed but not choreographed. Our first dance as a married couple was perfect! Thank you Dave! With dances being so popular at wedding receptions, many couples are choosingright along with the rest of their wedding preparationsto learn to dance, so their first dance as bride and groom will be something far better than the dreaded "rocking back and forth" that would so clearly announce that they don't know how to dance. Whether you prefer the more traditional wedding-dance styles such as Waltz or Foxtrot, the newer styles such as Salsa, Cha-Cha, or Swing, or a Country style such as Nightclub Two-Step, Dancer Guy can teach the bride and groom, or the entire wedding party, before the wedding date. The guests will then be suitably impressed when the wedding party hits the dance floor and executes a smooth, graceful, knowledgeable series of moves. Teaching the engaged couple: As mentioned above, the bride and groom will want their first dance to be a very smooth and sharp-looking dance. In order to accomplish this, Dancer Guy recommends starting private lessons about four to five months before the wedding, or even earlier if either person is nervous about his/her rhythmical skills or has the proverbial "two left feet." This might be earlier than you'd expect, but as with most things in life, there is more to dancing than meets the eye. See the FAQs below for further detail. Teaching the parents: If the parents of the bride and/or groom live close enough, Dancer Guy would be happy to teach them how to dance. Both sets of parents would probably want to learn the same kind of dance as the engaged couple, so not only would the groom's parents be able to dance together, and the bride's parents would be able to dance together, but the groom's mother and bride's father, and the groom's father and the bride's mother would also be able to dance together. And perhaps more importantly, a father/daughter dance and a mother/son dance would require almost no additional effort, as far as learning is concerned, because everyone would have learned the same style of dance. Teaching the wedding party: If your best man, maid of honor, groomsmen, and/or bridesmaids live close enough, Dancer Guy can teach them all how to dance. This is beneficial if you suspect that the guests at the reception will feel hesitant to start dancing, because they don't know how to dance, and they don't want to feel like all eyes are on them. If the whole wedding party is dancing, there is more of a crowd, and your guests will feel more comfortable dancing even if their skill level isn't as high as they'd like. Or, you could just consider the dance training as a gift to the wedding party. Teaching the wedding guests: In order to get the dance portion of your wedding reception off to a good start, it helps for guests to know how to dance. If you suspect that a significant portion of your guests do not know how to dance but would be willing to learn, Dancer Guy can attend your reception and give an actual lesson for anyone who wants to learn some of the basic steps. Then when the open dancing starts, they'll be able to do something more exciting than rocking back and forth. After the official lesson is over, Dancer Guy will be happy to mingle with your guests, answering questions, giving pointers on a one-on-one basis, and dancing with whomever would like to dance. If you would like Dancer Guy to attend your reception and teach dance to your guests, please give Dave the name of your DJ so they can coordinate the music in order the maximize the effectiveness of the dance instruction. If you do not plan on having a DJfor example, you are planning on having a live band for the danceDancer Guy can provide the sound system and the music for the instruction time so the band doesn't have to endure the start-stop-start-stop nature of the music during the instructional time. For any of the above teaching scenarios, Dancer Guy can do the teaching by himself, or he can have one of his co-instructors present to assist in demonstrating and instructing during the lesson times. The presence of a co-instructor during the open dancing portion of the wedding reception itself is also useful for "priming the pump," so to speak: people are more open to getting out on the dance floor if there are people already out thereit can be unnerving to be the first couple on the floor. Getting married is one of the most important days in a couple's life, and at the wedding reception, the bride and groom can be off to a much smoother starton the dance floor and in lifeif they have taken the time to prepare. How many lessons will it take? There is no simple answer for this, because it depends on how fast you pick up the skills, how much dance experience you come in with, how well you remember things from one lesson to the next, how long each lesson is, how often we get together, how much you practice between lessons (so we don't have to cover the same things repeatedly during consecutive lessons), how good you ultimately want to get, and so forth. Because the amount of time required can't be determined beforehand, Dancer Guy recommends starting early enough to make sure you'll have enough time: about four or five months before the wedding date, if you're learning just a single style of dance. (Of course, this applies to the parents of the engaged couple as much as it does to the engaged couple themselves.) If you get to the desired skill level before you need it, i.e., before the wedding, it's easy to maintain it. But it's much better to get to your desired skill level before you need it rather than after you need it. Of course, it's possible to learn in less time, but the longer you wait, the harder it is to get the desired results. It rarely works well to "cram" for a dance. And, it's better to have the dance lessons mostly out of the way before the wedding preparations get too hectic, as they do in the final month or so, because, when things do get hectic, most of your dance learning will already be done. There are so many things that can't be done until the last minute (flowers, cake, decorations, etc. ), but dance works sooooo much better if it's done ahead of time. . . . Remember that the 4-to-5-month lead time mentioned above is for a single style of dance; some couples want to learn two different styles and, for example, start with an elegant ballroomy style, and then halfway through the song, bust into something much more energetic and modern. In this case, two different styles would need to be learned, and the learning time would naturally need to increase. But I have the world's worst rhythm! Do you really think I can do it? Dancer Guy has heard this statement many times, and it is never as bad as the students think. There are certain rhythmical things you'll have to learn, of course, but it's not mysterious or mystical; it's just a matter of training. Another statement that Dancer Guy has heard many times (usually shortly after the above statement) is, "Oh! Well, that's not so hard. . ." Dancer Guy is well aware of the importance of understanding rhythm, and he teaches rhythm-related skills as an integral part of the dance. When you understand rhythm, your dancing looks so much better. . . .
Can't I just take the public classes instead of private lessons? Dancer Guy would not recommend it, because of the importance of your first wedding dance. Private lessons are customized specifically for the needs of the engaged couple, so they will learn more quickly and thoroughly than in large-group class. And, with a looming deadlinethe wedding dateyou don't want to waste time waiting for other students to catch up to you in a large-group class, and you do want to get problem areas resolved without making others in the large-group class wait for you. Also, it takes more than one series of public classes to gain enough skill to do a respectable job for your first dance, and at the end of each month, public classes either start over from scratch (if the class is offered in consecutive months) or disappear completely for a while (because there are more dance styles that I can teach than I have public timeslots for, so not every style is offered every month). In addition, private lessons include training in skills that you'd need for your first dance, and which is not included in public classes. If you absolutely cannot afford private lessons, multiple months of large-group classes is much better than nothing, but the content, emphasis, and goals of large-group classes make them much less appropriate than private lessons for an engaged couple preparing to dance at their wedding reception. 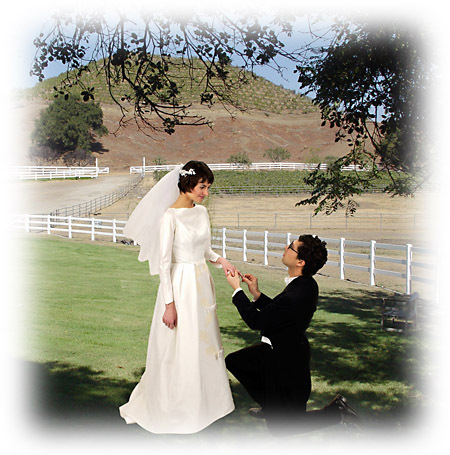 If you do private lessons in preparation for your wedding, you will definitely be more pleased with the results. What dance style should we learn? This is up to you. The most common dance styles done at weddings are Foxtrot and Waltz. Both are relatively simple to learn, but also can look very elegant once you learn how to do them. Of these two, the Foxtrot is a more versatile dance, because it works well with music that has a 4/4 time signature (which most music does). A Waltz requires a 3/4 time signature, so fewer songs will lend themseves to Waltz than to Foxtrot. But what about other styles? There is nothing wrong with doing Swing, Salsa, Cha-Cha, or other styles at your wedding reception. The couple at the right had a retro look to their wedding, as you can tell by the groom's zoot suit. Swing dancing is very appropriate in such a situation. In July 2006, two of Dancer Guy's students did Salsa for their wedding danceboth for the first dance (bride and groom only) and for the second dance (bride and her father, and groom and his mother)and they all looked very sharp. Later on, when dancing was open to everyone, the predominant styles were Salsa, Cha-Cha, and Waltz, with an occasional Swing thrown in. Another of Dancer Guy's engaged couples did a blend of three songs, and danced Foxtrot, then Cha-Cha, and then Foxtrot again. Swing, Latin and Country styles are all gaining in popularity as wedding dances. So the style you choose for your wedding dance is entirely up to you. Of course, if you have already selected a song, your dance style will have to be compatible with it. or Solid Sound Entertainment at (970) 667-0646 or 800-830-0646. Harpist: Mary Ellen Holmes at (970) 631-8972. Limousine Service: AA Limos at (970) 587-9299. Photographer: Expression Photography at (970) 310-3775.
or Ellis Ranch Event Center at (970) 593-9570.
or Berndes Weddings by Design at (720) 275-8621. White Doves: White Dove Release Company at (970) 980-6282. For even more options, go to Loveland Wedding Professionals, of which DancerGuy is a member, and see even more people who can provide services for your wedding!